The anti-social academic blogger ? A couple of months back I found myself joking on Facebook about the impact my increasing professional workload was having on both my on- and off-line social life. Since then I have found myself constantly reminded about the merits and importance of being a ‘social scholar’ – by which, of course, I actually mean a social media savvy scholar. If it is not the posters and emails reminding me of The Social Scholar Seminar Series presently being run at my current place of work, The School of Advanced Studies, then it is the regular blog, social media and email list posts on the subject that conspire to make me feel like an anti-social recluse and potentially a technophobe. In fact, it was Sam Kinsley’s (still relatively recent) blog posts on ‘Being a Sharing Academic’, ‘Curating Attention’ and ‘Professional Web Presence’ that inspired me to begin replacing my rather tired personal website and start my own blog but not, as this post outlines, without some reluctance. Blogs can benefit collective academic endeavour if we as academics are brave enough to use them to share unpolished work in order to allow its development through dialogue with others. They, along with Social Media platforms like Twitter, Facebook and Instagram, can facilitate an ethos of academic sharing and dialogue, but unlike like these other platforms they lend themselves better to longer comments and responses, built on more considered thinking and multiple sources. Blogs need not only serve narcissistic aims nor be used solely to lay claim to intellectual territories. Social Media can no longer be ignored by academics, especially those at the beginning of their careers – not least because of the uncertainty of academic employment. Blogging can no longer be dismissed as a distraction from ‘serious’ scholarly work and thus is already becoming bound up in broader academic performance pressures. I broadly agree with all these points but it is the last that I have the hardest time swallowing. This is less to do with the distinctions between social media outlets and traditional routes of academic dissemination as with my concern for the increased pressure this places us all under. Perhaps most importantly I am concerned with the impact that the ‘post or perish’ (to pervert the old saying) mind-set might have on the work/life balance of academics – a balance that even before the rise of social media was, as we all know, generally conceived to be tipped drastically toward the work side of the scale – hence the stereotypical, albeit increasingly revised, image of the socially awkward and isolated professor. But what might our increased use of social media for academic endeavors do to our other forms of sociality between the on- and off-lines? I used to use Instagram to stay better connected to my partner and her family when I was away studying or working. Recently, however, I have begun using it primarily to engage in a visual dialogue in the build-up to a conference where I and my co-presenter, Lachlan MacDowell (a scholar from Melbourne University who I have not yet met in person) will discuss social media’s impact on the preservation of street art and graffiti. Some of my friends and family initially liked and commented on the images that I posted related to our project but more recently they have gone silent and I have been left feeling more isolated from them (of course I could avoid this by opening two accounts, one personal and one professional, as many people do – but wouldn’t this just increase the strains on my time and attention?). In recent months I have also increased my use of Twitter as I prepare for a new post-doc position in a social media studies department. This has definitely proven to be a great academic resource in allowing a simple way to start academic discussions, share hypotheses, request useful references, engage in parallel conversations during conferences, and even contribute to conference debates from a far, all with relatively minimal additional effort. But the perils of ‘Twitter at the table’ when an interesting and thought provoking post can wretch my attention from my more immediate surroundings is a growing frustration for me as much as my loved ones. It all reminds me just a little too much of Zygmunt Bauman’s keynote at the re:publica 15 conference that I attended last month. He discussed how today most people seek publicity rather than privacy, primarily through social media use, and they are thus replacing the community networks which previously belonged to them with the social networks to which they now belong. 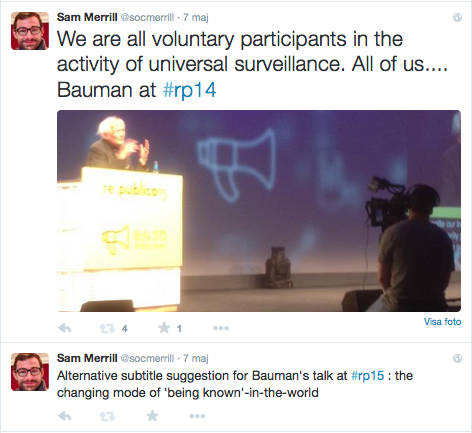 I remember quipping on Twitter that the meaning of Bauman’s talk may have been better served by the subtitle “the changing mode of ‘being known’-in-the-world” rather than just simply “being-in-the-world”. There is now a widespread acknowledgement that academic progression, especially at the early career stage, often relies on one’s ability to develop their own recognisable brand. This narcissist factor of academic social media use is another that leaves me feeling inherently uneasy about blogging even as I engage in it more and more willingly (the narcissism that is, not the blogging). Although there is little new about Bauman’s prognosis – that social media leads to the state of being alone together – the fact a future colleague later admitted that what Bauman had described sounded just like him made me shudder as I realised that if the pressure to use social media and the Internet for academic purposes was so apparent across the disciplines that I had already encountered (archaeology and geography in particular), then what must it be like in the field of social media studies that I was about to join – and how would I ever find enough time to relieve it! My last blogging venture clocked in at only twelve posts in just a little over three years so I hope I manage to improve on that figure at least. In this respect, at least, I am encouraged that the list of ‘geographers that blog’ provided by Sam is appended by ‘relatively frequently’ in parentheses. Indeed some of those listed show long periods of inactivity (of around two years) suggesting that although blogs are no longer considered distracting from ‘serious’ scholarly work they are the first to suffer in the moments of increased work loads within an industry that still prioritises traditional forms of publication. It would be interesting to see how interregnums in blogging activity reflect other scholarly efforts and indeed whether over time I will be able to map these shifting priorities across my own posts and publications. Ultimately, however, I realise that even as I write the first entry of this new blog, I remain full of uncertainty as to whether it will be long lasting and/or a success. My doubts over its potential impact on my work/life balance are perhaps a greater concern. In other words, I am interested to see whether my effort to be more sharing and social in my professional work through blogging and my use of other social media platforms will conversely make me more anti-social in my personal life. Obviously, I hope this will not be the case but the irony of having written the guiding notes for this post at 3 AM after having sneaked away from my partner in bed has not escaped me and does not bode well.